Baseball Umpires Don't Get Overtime. Does That Affect Extra Innings? Nearly every worker has been in this situation. You're about to go home for the day, and the boss says, I need you to stay a little bit longer, could you just finish this extra work? Now, if you're lucky, you get paid overtime for that. But sometimes, you just have to work longer, and you get nothing. NPR's social science correspondent Shankar Vedantam brings us an account of how this plays out in a pretty unusual work setting. Hi there, Shankar. SHANKAR VEDANTAM, BYLINE: Hi, David. GREENE: So just to give people a clue, this is a work setting where you might buy me some peanuts and cracker jacks. VEDANTAM: That's exactly right. We're talking about baseball games. VEDANTAM: And the workers we're talking about are baseball umpires. I was speaking with Michael Lopez at Skidmore College. He was watching a game a couple of years ago between the St. Louis Cardinals and the Chicago Cubs. Game was tied. We're in the bottom of the 10th inning, bases loaded. If the Cubs score, they win. On a 3-1 count, the umpire had to rule if a pitch was a strike or a ball. He called it a ball. The Cubs won. On replay, Lopez says, it was obvious the umpire had made the wrong call. Now, instead of getting mad at the umpire, Lopez got to thinking. And he discovered baseball umpires are not paid overtime when games go into extra innings. MICHAEL LOPEZ: Well, my thought was that it was the bottom of extra innings. And in that situation, baseball games can drag on. And if the game extends beyond the 10th inning, it might be a 15, 16, 17-inning game. And so in that situation, umpires have some incentive to end the game a little bit earlier because when the game goes to extra innings, they're getting paid the same regardless. And if they're not being paid for that extra time, there's no obvious incentive for them to keep the game going. GREENE: No obvious incentive, although the incentive might be to get the call right. So could it have been just this umpire made a mistake in this game and he wasn't just trying to go home? VEDANTAM: So yes, that's absolutely a possibility. This is just one call. There could be any number of reasons the umpire made that call. So Lopez and his fellow researcher Brian Mills turned to the data. They analyzed all extra innings Major League Baseball games played between 2009 and 2016. They looked at some 32,000 pitches where the umpire had to make a judgment call, ball or strike. They crosschecked the calls made by the umpires against the electronic data showing the precise location of the baseball as it crossed home plate. Most of the time, the umpires made the right calls. 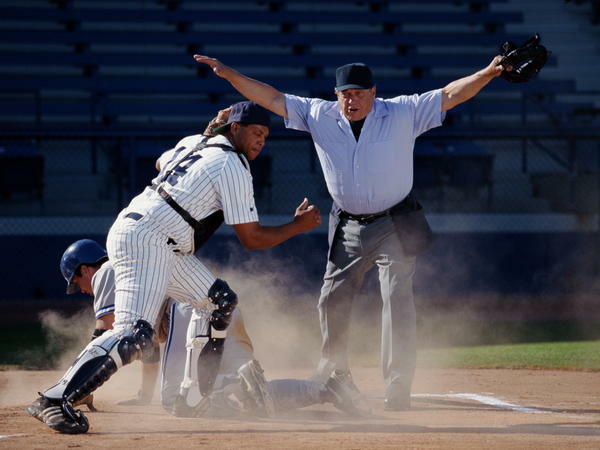 But in 50/50 situations, umpires tend to make calls that help bring the game to an end quickly. LOPEZ: It ties into how a lot of humans would behave in situations that don't involve sports. And so if you're tasked and paid sort of a fixed amount to fulfill a certain role or to work for your employer and then you're asked to do overtime on top of that work, you might act in ways that try and end that overtime as soon as possible. GREENE: And, Shankar, I guess over the long period of time this will affect teams in a balanced way, but if you lose that one game and you're convinced an umpire was trying to end the game and made that call that lost you the game, that must stink. VEDANTAM: It would stink. Now, of course, it's useful to remember, David, that players are workers, too. Now, most players would indeed prefer to win games, but I'm guessing there might be at least a few who say, all right, game over, I get to go home now. GREENE: Maybe, although winning is probably the most important thing to most of them. Shankar, thanks a lot, as always. GREENE: That is Shankar Vedantam. He is NPR's social science correspondent. He's also the host of a podcast that explores the unseen patterns in human behavior. It is called Hidden Brain. (SOUNDBITE OF CLOUDKICKER'S "GARAGE SHOW") Transcript provided by NPR, Copyright NPR.